The Minnesota Historical Society is looking for someone to take on the problem of 1862 and its 150th anniversary. The job will remain open until filled, that is until someone is found who is willing to plunge into this thorny topic. For anyone who is not familiar with 1862, it may be hard to imagine how difficult it will be to find someone who is willing to do this, and even more, someone capable of taking on the job and making it successful. First of all 1862 refers to the events known by various names relating to conflicts between Dakota people and white people starting in Minnesota in August 1862, and all that flowed from those events. In the job announcement the Historical Society has chosen to call these events the U.S.-Dakota War of 1862, though they did not start or end in 1862. The year 2012 happens to be the 150th anniversary of 1862. A monument in Mankato, MN, one of many remnants and reminders of the events of 1862 and that attitudes that survived in the years after. Minnesota Historical Society photo, probably taken with a camera belonging to the photographer Monroe Killy, who is pictured in the photo, around 1930. Remembering 1862 and what happened then, before or after, would be difficult enough, but it is made more difficult by the role that the Minnesota Historical Society–in an overall, institutional way–has chosen to play in the Minnesota of the last twenty years. The Historical Society has tried to be a bringer of good news, an institution that puts on entertainment, rather than one that deals with serious historical issues. Unfortunately there is little in the way of good news about 1862. There was no good news in 1862 and there has been no good news about 1862 in the years since then. There is a great deal about 1862 that was tragic for all concerned. To deal with 1862 requires a sense of the tragedy involved. Can the Minnesota Historical Society handle tragedy? It is clear that the Historical Society would like to hire a Dakota person to do this job. And while the Historical Society is on the verge of the possibility of change, now that its director Nina Archabal has retired, it is not clear that the Historical Society is willing to deal with 1862 in a serious way. Is there a Dakota person who is ready to be a mediator between an institution designed to entertain a large public and a Dakota community in which there are many points of view about 1862, but in which there are few that view 1862 as a source of entertainment? It would be a difficult, thankless job. Perhaps it is a job that can be done. But it requires a lot of soul-searching in the halls of the Historical Society before one can imagine it being successful. There is of course a lot more to say, and there are two more years in which to say it. And maybe there is someone who can make a difference. If so, that person, would be making a great contribution not only to the Minnesota Historical Society, but to the state and the people of Minnesota. And that person would probably deserve a lot more than the money offered in this job announcement. The Minnesota Historical Society’s External Relations division seeks applicants for a Program Specialist, 1862 position to assist the Deputy Director in planning, funding, coordination, and promotion throughout Minnesota related to the observance of the Sesquicentennial of the U.S.-Dakota War of 1862. This is a full-time, project position (2088 annual hours) located at the History Center in St. Paul, MN working through June 30, 2011. Renewal dependent upon available funding and program need. Summary of Work: Responsibilities include: 1) oversee the work of the managers of U.S.-Dakota War of 1862 projects and partnerships; 2) monitor U.S.-Dakota War of 1862 budgets; 3) monitor and facilitate the work of other managers with external partners; 4) coordinate the work of project managers, the Marketing & Communications Department, and the Director of Public Policy & Community Relations; 5) work with the Deputy Directors and U.S.-Dakota War of 1862 project managers ; and 6) provide work direction to assigned staff. B.A. plus five years program experience or equivalent OR an advanced degree plus three years program experience or equivalent. Experience supervising a major project with demonstrated ability to plan, organize and monitor a project with many disparate elements. Ability to lead a diverse group of people and facilitate cooperation. Knowledge of, and sensitivity to, institutional and program concerns, procedures, and techniques. Ability to develop and track budgets. Detail oriented with strong planning, monitoring and follow up skills. Experience working with Dakota people. Knowledge of Minnesota and/or Dakota history. Ability to speak effectively in public and relate easily and positively to many different audiences. Application Deadline: This position will remain open until filled. The fact that human history is often filled with cruelty, greed, violence and passion can make for PR problems. Unfortunately these characteristics are also what makes history an interesting field of study! Ignoring past unpleasentness on the part of insitutions like MHS can lead to the emphasis of nostalgia over historical reality in the society’s programs and exhibits. This does is disservice to both the public and the institution. Maybe I am nieve, but I think people do want to know why a thing happened and what it meant to people then and means to them now, even horrors like 1862. Boozhoo (hello) for Men and Ahneen (hello)for women How come no Lakota (bwan or ginaybick) are not participating in devulging facts and truth from 1862? I may not have the credentials to compete for this position but please share with this ojibway reasons Lakota are appearing not to be involved? Mii gwich (thank you). I am very excited to see the outcome of this project. A long time ago i studied the Dakota language and history and became very interested and today i pass on what i’ve learned to my boys. I wish that i could be a part of this, there are alot of stories that probably havent been shared by our elders regarding this specific time. Research hard and good luck with whom ever takes on this job. The fact that MHS couldn’t even figure out a way to examine the 2005 bicentennial of Zebulon Pike’s expedition to the Falls of St Anthony and points north, makes me wonder about their ability now, too. I think it can be done, though. Some years ago, we did a program for River Rendezvous in Bloomington, “Like Ducks on a Log” telling the Pond Bros. story from the perspective of the Mdewakanton band living at what is now Lake Calhoun and narrated by Eddie Whiteman. The denouement of the show was the largest mass execution in US history (followed by an epilogue on the death of Gideon Pond). Interestingly, the Pond House, the City of Bloomington, and the Mdewakanton representative to the Pond site were all supportive of this telling. 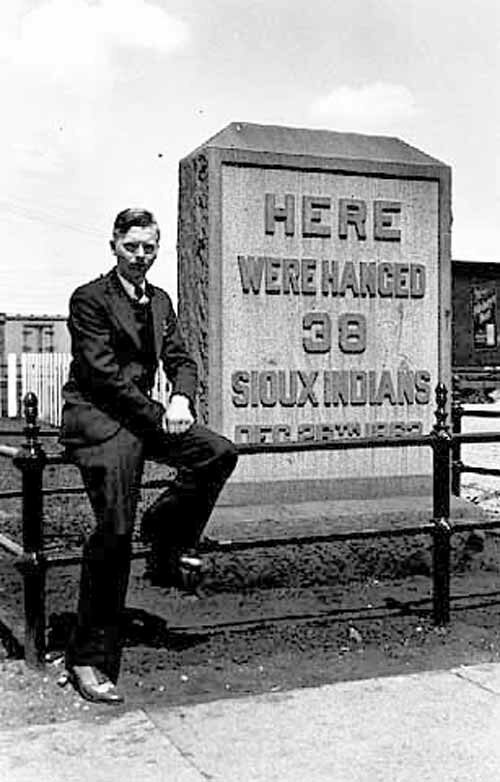 It was entertainment, yes, but also educational from the standpoint of representing the history of the Dakota and whites in the now Twin Cities area, warts and all appearing on all faces.